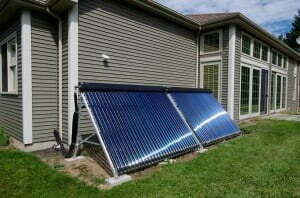 New York resident, Peter N., installed a SunMaxx Solar Thermal Hot Water system in his home. One year later, he is truly seeing the payback in going solar. The system does supplement Peter’s radiant heating, with the primary heat source being ground loop water to water heat pump. The top coil in the holding tank will be used for additional floor heat. The system included 60 SunMaxx Solar ThermoPower Evacuated Tubes, and two 105 gallon coil tanks feeding a 120 gallon domestic hot water tank. The system is also plumbed to allow future expansion.